This miniature heroine "lifts" your favorite stories using superhuman strength (aka a magnet). After a full day of fighting crime, this miniature superhero has her priorities straight: Saving the stories! 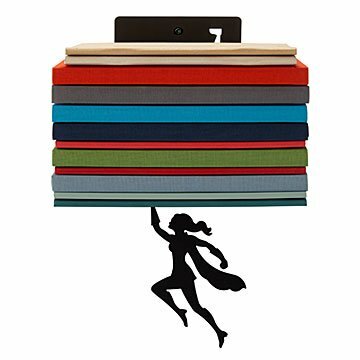 The little defender appears to have extraordinary strength, "lifting" a row of your favorite books and hovering in thin air. Slide the base into the cover of a paperback book to disguise it, and the heroine connects on the other side with superhuman strength (aka a magnet). It's a playful nod to your favorite leading ladies and courageous protagonists. A mighty good gift for literary lovers, the design will delight a teacher, writer, or just a voracious reader. Designed by Ori Niv in Tel Aviv, Isreal. Made in China. Ori Niv believes that practical designs can be beautiful, well-crafted, and sprinkled with humor. His products are created for people who are drawn to originality, and who believe their living space should have character. Ori has a degree in product design from Tel Aviv University in Israel. After he graduated, he started his own business, creating one-of-a-kind works like his superhero bookends, and countless other unique designs. Today, Ori works with a team of designers to create fresh new decor and functional products that are also entertaining. He lives and works in Tel Aviv. Maximum weight recommended: 7.7 lbs. Do not overload. Perfect gift for Super Daughter who loves her evening book time with her furry friends. I will gift this to my daughter. It's smaller than I expected but the message it delivers is huge and inspiring. I love to outfit my rental property with unusual things - this fit the bill perfectly! Haven't used it yet because I bought them as gifts. But am sure they will love them -- and will be pleased with the "super heroine" theme -- and that adorable little caped crusader that "holds up" the shelf. Super clever!! My friend loved it, great quality and adorably functional!